Tues …was Kimono day practice. It was COLD COLD. It could have been worse at the Shrine dojo, besides not being open. So glad that worked out this way. 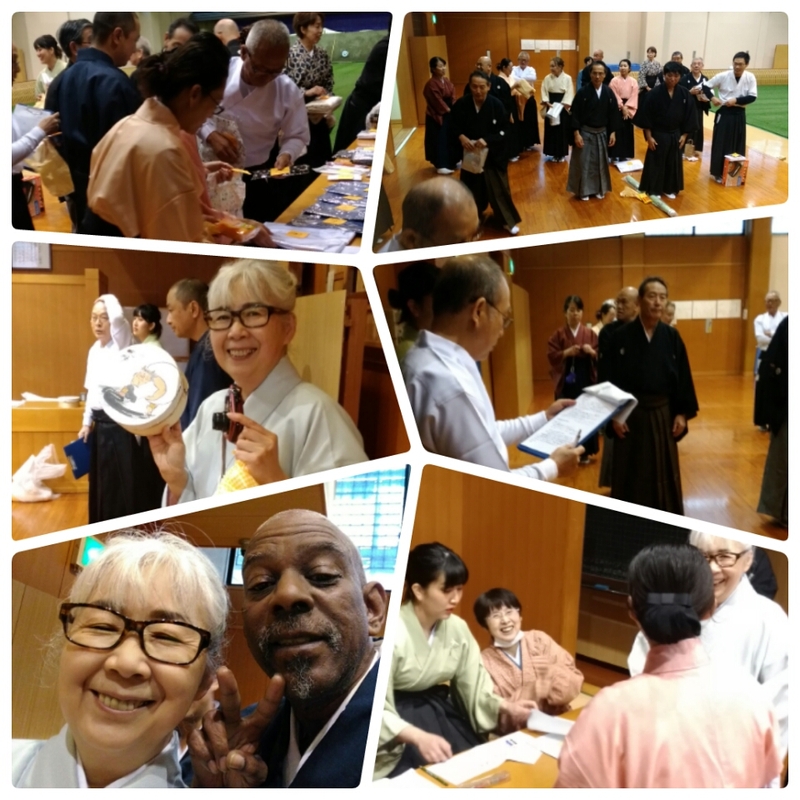 So this day Ishibashi Sensi was going to run the class no one else was there. I thought at first there was not going to be a session that day. When I arrived it was almost just me, and the others who came in later did not have on Kimono. Shacho and Sato Sensei was not there, but there was still to be a class, but Ishibashi was running it. So what is funny is he is from the Shrine Dojo, not Kishiwada. So I was feeling pretty good about my last couple of practice sessions. I felt I was on the right track and finally things were falling in to place. I still needed work but I was heading in the right direction. The next event was today. the Hatsukai, first shooting of the year. 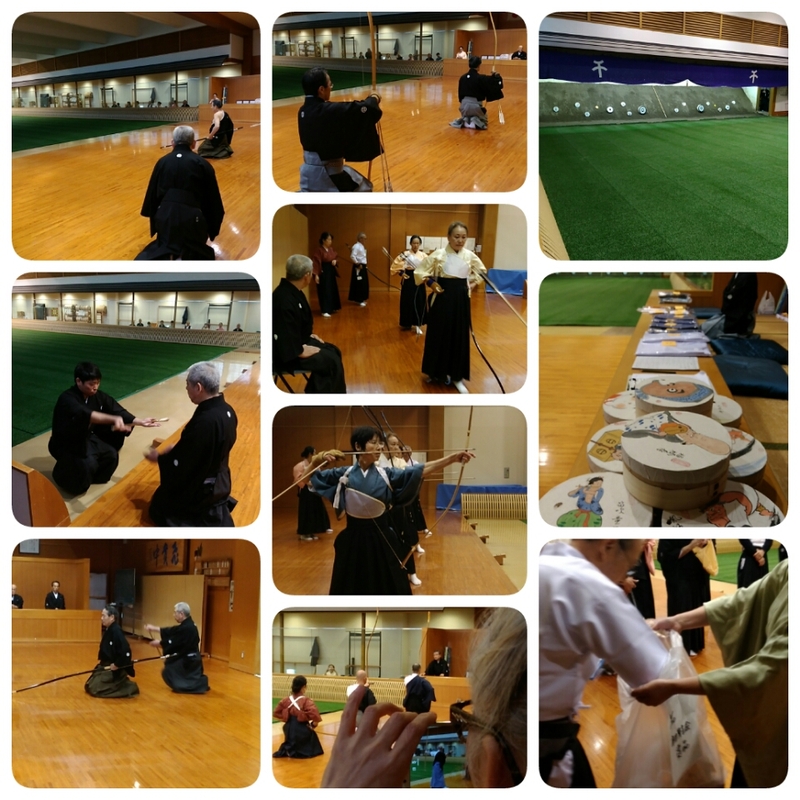 It was held at our dojo and usually is just an inner dojo event. small. I knew it was going to be small because it started at 1:00 pm. The dojo closed at 5:00. It was a COLD day! brrr yuk! I dressed best as possible. I wore my kimono, it was a better idea rather than change. The other thing about the day beside cold, it was raining. So I had rain and cold to deal with. I was able to cover up pretty well with my raincoat, I did not have to carry anything but a small bag for stuff. With umbrella in hand, I set out for the dojo. Fairly warm and dry. the rain had stopped for the moment. I arrive just a little paranoid that I had read the sign wrong and it did not start at 1:00 but early in the morning. I pushed that thought to the rear and keep on moving through the flashes. I arrived on time, plenty of time in fact. I timed it right. Had time to get in a couple of Makiwara shots, I could have done the mato, but I did not want to be in the way as they were starting to set up for the Hatsu -Raikai. It was COLD inside the dojo and even fewer people than I thought turned out. Ok, enough though to be fun. A couple of my buds were there. I had been asked to do something, so I thought a few days earlier at the Raekai. I did not understand what. So I was expecting someone to tell me something. I watched, waited and took photos as usual. No one said anything, ok. Not really disa pointed. The only time I was called was to join my group section to shoot. 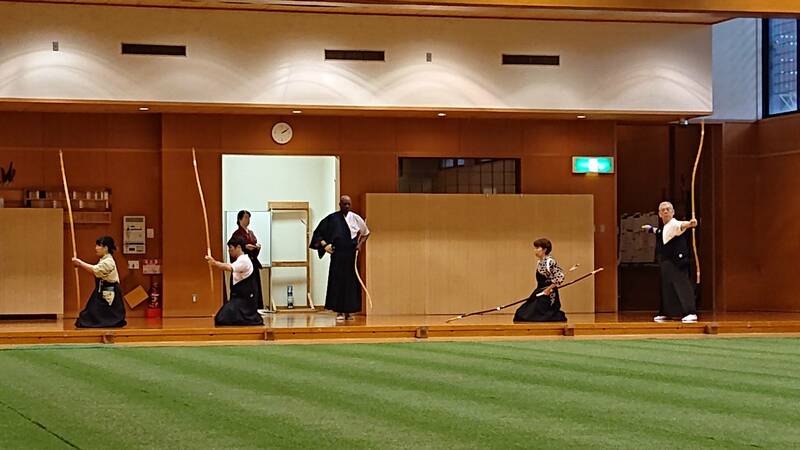 We started with the usual formalities and a Sensei shooting the single mato. Then two sensei did, hitomato. One Mato two shooters. That was different from usual. That was followed by regular students in groups of three but two groups at a time. Usually, we start with the tournament timing, but today we started with Shinsa timing. Afterward came the tourny timing but with only two arrows, not four. That was also different. I figured they wanted to be sure to finish in time. That was followed but tourny timing but with a mix of targets, mato and smaller. This time with a single arrow but two rounds. So far I am zero for 3. Next section was back to standard mato but only 1 ya. Then everyone shoots around but only those who hit come back for another shot. Ok we line up and prizes were given out for the hitters. Then a large plastic bag is brought out, everyone was called up to pick something out of the bag. As I did not know what was going on, I was quite surprised when I heard my name and was told to pick from the bag. Ok, I dug in an pulled out a small package. After everyone had picked, we were told to open the packages. I still did not know I just watched a followed. I opened mine it was a package of hand warmer pads. They come in handy. I intended to bring one with me for the day. People here put them in their waistbands front or back. to help stay warm. I noticed some people had post-it notes and there were some on the “gifts” still out. Still uncertain what was going on, I turned my package over and found a sticker on the bottom. hmmm. ok, mine was blank, but I turned it over and there was a number. I asked a sensei, what is this about? ( but not like that). He told me showed me what was up. I found an item with my number. Ohhhh. I get now. Ok. I got a prize for my pick out of the bag. The entrance fee this year was high, usually 300 yen, this time 800 yen (about $8.00). so there were some good winning for the shooters plus some decent things for the grab bag. My prize, I do not know what it was it was packaged up and I did not open it. I think it was a Yumi cover. Whatever it was it was pink and flowery. Yuk I thought, jheeze what will I do with this? I started to walk when I spotted my friend who was having a good day. I walked over and showed her my “prize” ! She looked and said ohhh pretty, I said “it is yours” Ehhh? she says. I say you like pink right, then this is a Christmas present for you. She was delighted! So that was it for my day. No hits, all misses, even with the draw prize, except for the heat pads.